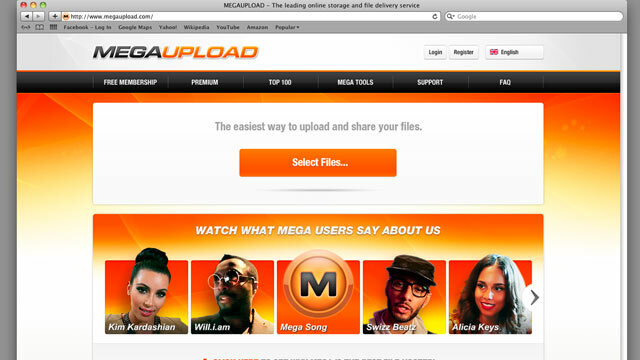 The Justice Department has indicted seven individuals and two companies behind the popular file-sharing website megaupload.com, which has been touted by stars will.i.am, Kim Kardashian and Diddy, and, according to reports, has hip-hop producer Swizz Beats as its CEO. The indictments, which do not include Swizz Beats, seemed to trigger a series of distributed-denial-of-service attacks, apparently by the hacker group Anonymous, that hobbled several federal and entertainment industry websites. The indictment alleged that megaupload.com and a shell company associated with the website, Vestor Limited, caused an estimated half-billion dollars in copyright losses and made an estimated $175 million in proceeds. The website was established in 2005 and at one point ranked as the 13th most-visited website on the Internet. The feds indicted the site's founder, Kim Dotcom, a.k.a. Kim Schmitz, a 37-year-old resident of Hong Kong and New Zealand. He was arrested in New Zealand by New Zealand authorities. Also indicted were employees Bram van der Kolk, a.k.a. Bramos, 29, Julius Bencko, Finn Batato, Sven Echternach, Mathias Ortmann, and Andrus Nomm. New Zealand authorities arrested Batato, Ortmann and van der Kolk. Bencko, Echternach and Nomm remain at large, officials said. The indictment accuses the suspects of being members of "the Mega Conspiracy, a worldwide criminal organization whose members engaged in criminal copyright infringement and money laundering on a massive scale." The case came a day after Internet companies and websites such as Google, WordPress and Wikipedia protested about the Stop Online Piracy Act (SOPA) and the PROTECT IP Act (PIPA). An hour after the indictment was announced, the Justice Department's website, www.justice.gov, came under cyberattack. Anonymous, the hacktivist computer group, claimed responsibility. Asked about the claims by Anonymous, a Justice Department spokeswoman said, "The Department of Justice Web server hosting justice.gov is currently experiencing a significant increase in activity, resulting in a degradation in service. The department is working to ensure the website is available while we investigate the origins of this activity, which is being treated as a malicious act until we can fully identify the root cause of the disruption." The Justice website appeared to be back online this evening, but with limited graphics and pictures. The FBI's website also appeared briefly to be inaccessible, but later came back online. The attacks appeared to be distributed-denial-of-service attacks, rather than hacks in which data was compromised or lost. Distributed-denial-of-service attacks flood Internet sites and computer networks with requests for information and commands, making the networks and websites unavailable to computer users. Members of Anonymous were sending around a link that appeared to help contribute to the attack, with some computer users sending requests to FBI.gov and justice.gov when they clicked the link. Websites for the Recording Industry Association of America, Universal Music and the Motion Picture Association of America also appeared to be unavailable or under attack. The federal indictment returned by a grand jury in Virginia against megaupload.com alleged, "In exchange for payment, the Mega Conspiracy provides the fast reproduction and distribution of infringing copies of copyrighted works from its computer servers located around the world. Premium users of the site ... are able to download and upload files with few, if any, limitations." Describing the operation of the site and relations with users the indictment noted, "For much of its operation, the Mega Conspiracy has offered an 'Uploader Rewards' Program, which promised premium subscribers transfers of cash and other financial incentives to upload popular works, including copyrighted works, to computer servers under the Mega Conspiracy's direct control and for the Conspiracy's ultimate financial benefit." The seven suspects have been charged with participating in a racketeering conspiracy, conspiring to commit copyright infringement, conspiring to commit money laundering and two substantive counts of criminal copyright infringement. If convicted they could face a maximum of 20 years in prison.